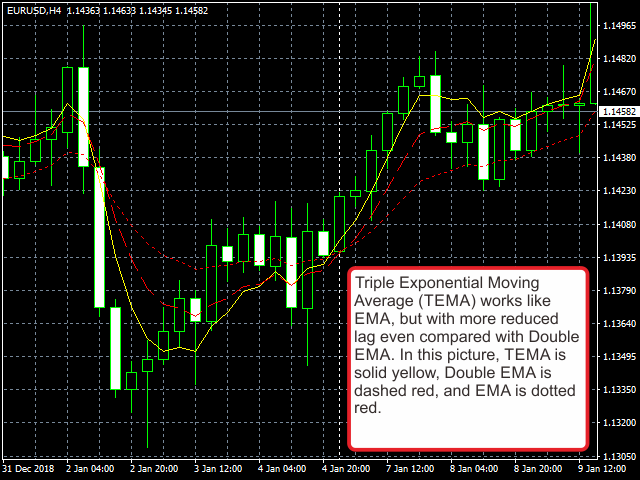 Triple Exponential Moving Average Technical Indicator (TEMA) was developed by Patrick Mulloy and published in the "Technical Analysis of Stocks & Commodities" magazine. It works as the same as EMA. However, it provides smaller lags, even compared to Double EMA. period: MA's period. Must be higher than 1.
applied_price: Define the price to be applied. Use 1 of these integers. shift: give an additional offset for the signal. Must not be higher than period. Wrong description fixes, and off-by-one bug fix at the most left of the chart (like in 14-period indicators, it must start at 14th bars).